Welcome to the world of Lois Hill. With the launch of the 6156, the designer continues to explore the world and its cultures, fuses age-old crafts with modern technologies, and transforms this unique melting-pot into her signature. She has imagined a steel case whose bezel is embellished with engraved filigree floral patterns. This elegant decoration spills over onto the horns and silver dial. The sterling silver bracelet confirms this attention to detail with links whose granulated effect has been created by hand. 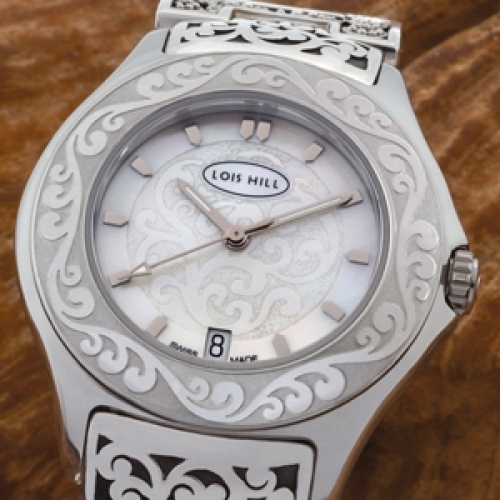 The finished piece is as much adornment as watch, conveying Lois Hill's vision of jewellery and timepieces as one.